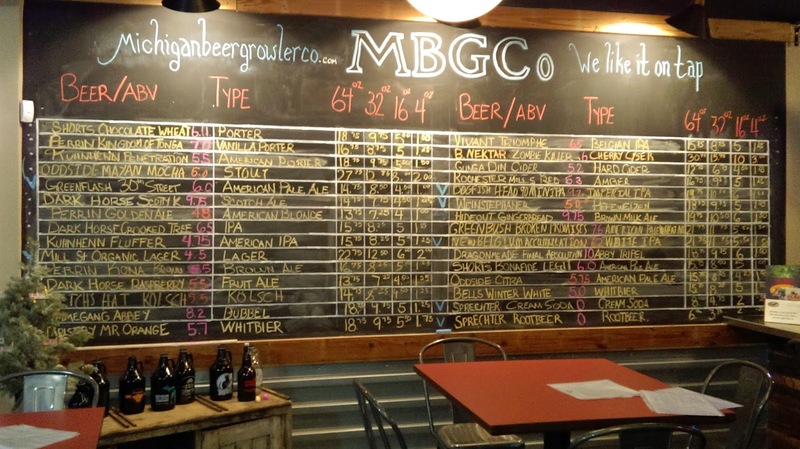 MBGCo feels like a hybrid of bar and a store. 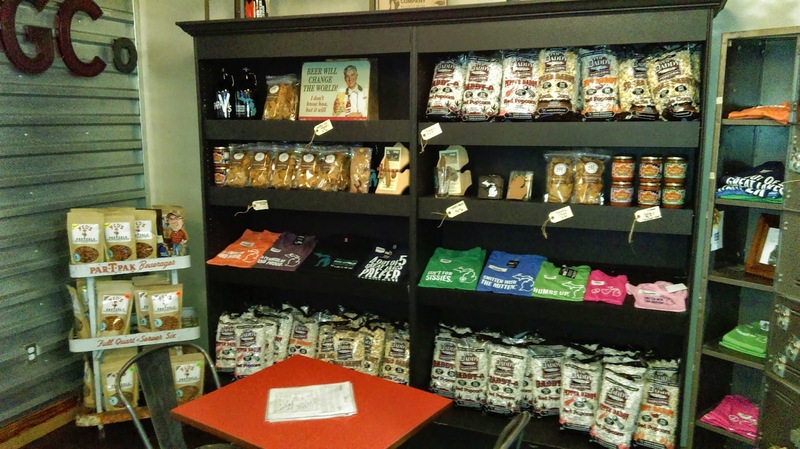 Customers can sit at stools at a traditional bar or at a collection of tables, but MBGCo also has a corner dedicated to Michigan-made products such as t-shirts and snacks. Their main focus is providing customers with great beer, so they do not serve food (patrons can bring their own food in). MBGCo has a few standard beers on tap, but the remaining selection changes regularly, always giving customers something new to try. I visited on a Wednesday night shortly after 5:00 p.m. Only one other customer was inside. He was a first-time visitor as well. The bartender was welcoming to us newbies and answered our many questions about the twenty-six beers on tap. He gave us strong recommendations based on our tastes. MBGCo allows its customers to make informed decisions by offering small free samples of its beers. The bartender allowed me to taste four new beers before I settled on two excellent Michigan beers, the Perrin Kona Brown and the Kuhnhenn Penetration Porter. If I didn't have to head home, I would have liked to have a beer at the bar and discuss craft beer a little longer. MBGCo will refill growlers and howlers from any brewery, so long as they are the standard 64 oz. or 32 oz. sizes. They also sell their own growlers for $5 each. Most of the beers are priced in the $15 to $20 range for a 64 oz. growler, so they are more expensive than they would be in a six pack but less expensive than buying four pints of the same beer at a typical bar. They also offer a rewards program where they fill a customer's eleventh growler for free. Draft beer in the comfort of my own home! When I opened my two growlers at home, I was impressed at how well the beers kept and how they still tasted like they were straight from the tap. Maybe it was the comfort of my own home or the larger sample size, but I enjoyed both beers from the growler more than I did from the small samples at the bar. The taste alone justified the extra cost. 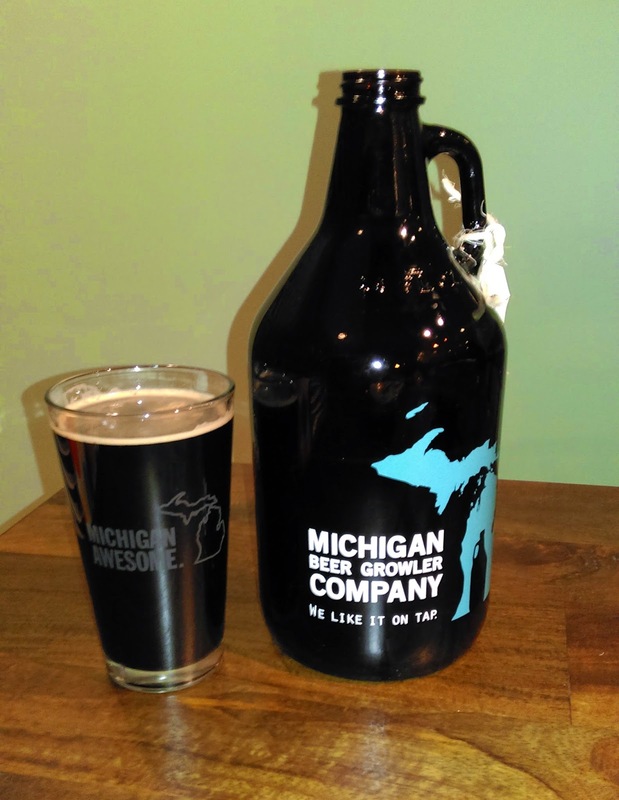 I am happy I signed up for the Michigan Beer Growler Company's rewards program, because I definitely will return. I highly recommend a visit to MBGCo for any craft beer lovers. 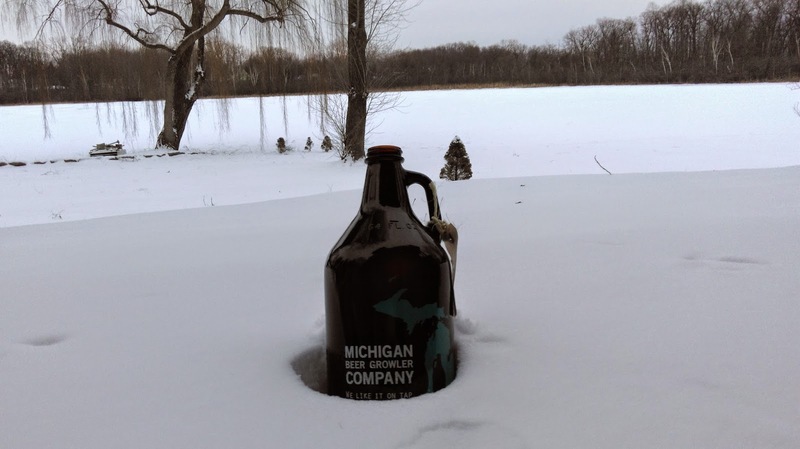 The Michigan Beer Growler Company is located at 31221 Southfield Road, Beverly Hills, MI 48025. Telephone: (248) 385-3773. Website: michiganbeergrowlerco.com.